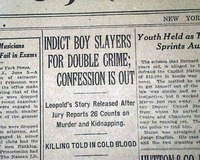 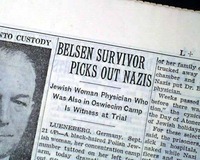 One of the more sensational trials of the 20th century was that of Nathan Leopold and Richard Loeb, two young, Jewish, & wealthy college students who wanted to commit the perfect crime. 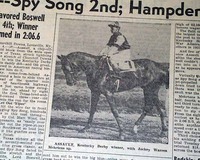 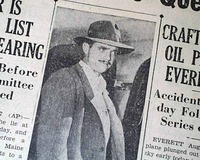 The front page has one column headlines: "CARUSO, WORLD'S LEADING TENOR, DIES SUDDENLY" "Had Been Operated on for Abecess Between Liver and Diaphagm" and more with photo. 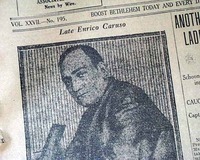 (see) 1st report coverage on the death of famous Italian tenor, Enrico Caruso. 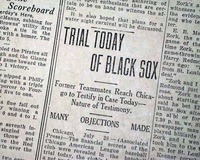 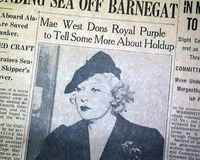 Page 9 has one column headings: "TRIAL TODAY OF BLACK SOX", "Former Teammates Reach Chicago to Testify in Case Today--Nature of Testimony", "Many Objections Made"
The front page has a two column photo of Mae west with heading: "Mae West Dons Royal Purple to Tell Some More About Holdup" with text underneath (see photos). 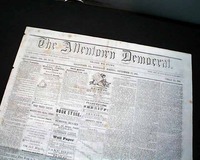 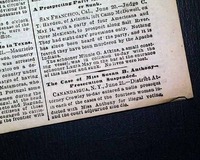 The front page has a very small and discrete one column heading at the bottom of the last column: "The Case of Miss Susan B. Anthony--Prosecution Suspended"
which is a brief mention of her recent indictment for illegal voting. 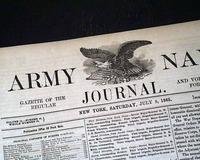 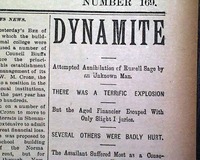 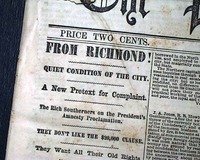 Not surprisingly this issue has much Reconstruction related reports, including: "Soldiers! 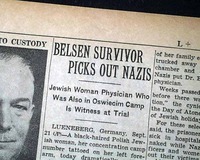 Who are Your Friends?" 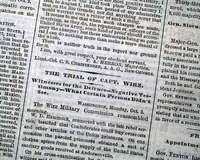 "The Trial of Wirze" "How Stand We?" 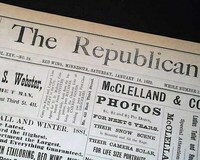 "The Beginning of the End of Radicalism" & more. 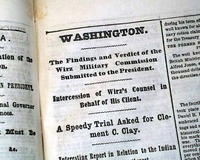 The top of page 5 has; "Washington" "the Findings & Verdict of the Wirz Military Commission Submitted to the President" "Intercession of Wirz's Counsel in Behalf of His Client". 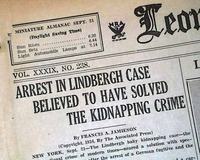 Red Wing, MN... the missing link is found! 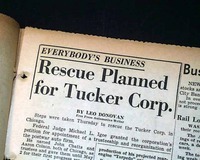 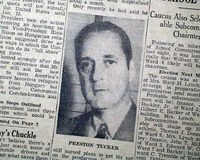 Preston Tucker loses control of company.. 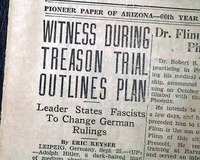 This 8 page newspaper has one column headlines on the front page: "WITNESS DURING TREASON TRIAL OUTLINES PLAN" and "Leader States Fascists To Change German Rulings". 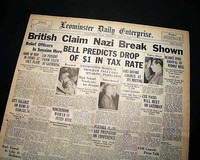 This was just before Hitler gained power. 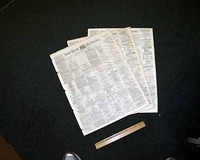 Minor wear along the spine, otherwise in good condition. 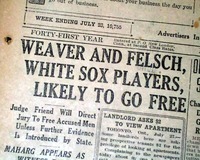 This 12 page newspaper has a two column headline on the front page: "WEAVER AND FLESCH, WHITE SOX PLAYERS, LIKELY TO GO FREE" with subheads. 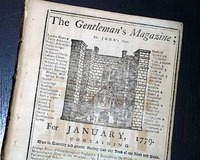 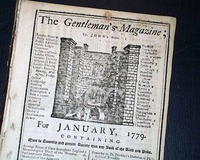 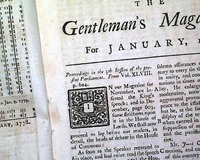 THE GENTLEMAN'S MAGAZINE London, December, 1780 The issue begins with 7 pages of "Proceedings in the Last Parliament" which includes discussion of the Revolutionary War in America. 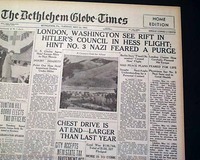 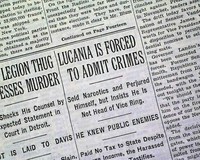 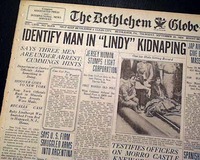 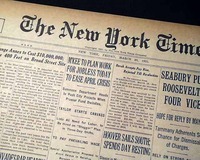 THE NEW YORK TIMES, June 4, 1936 This 48 page newspaper has one column headlines on the front page: "LUCIANO IS FORCED TO ADMIT CRIMES", "Sold Narcotics and Perjured Himself, but Insists He Is Not Head of Vice Ring" and more. 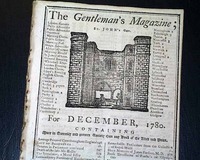 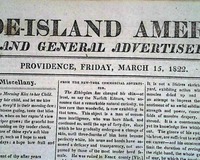 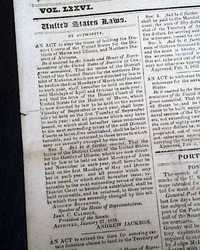 THE DAILY GRAPHIC, New York, March 17, 1785 The full frontpage is of "His Eminence Cardinal John McCloskey - Proclaimed by the Consistory at Rome Last Monday". 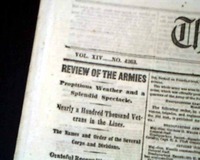 Within the issue is "The Lat M. Corot, French Painter", "The Trial of Rev. 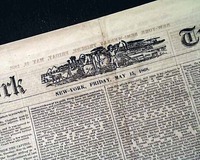 Henry Ward Beecher", "The New York Medico-Legal Society" and other news and advertisements. 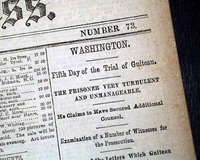 This 52 page newspaper has one column headlines on page 17: "SIX-WEEKS DIVORCE MADE LAW IN NEVADA", "Secret trial Provided--Governor Also Signs Bill to Legalize Gambling--Reno Prepared"
This 18 page newspaper has a one column headline on page 4: "ROCKET PLANE FAILS; ANOTHER TRIAL PLANNED" with smaller subheads. 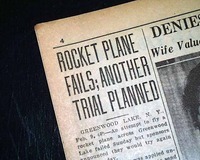 Tells of the 1st test flight try of the 1st U.S. rocket mail plane. 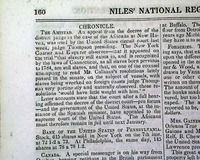 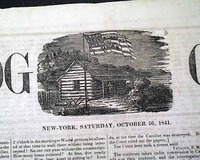 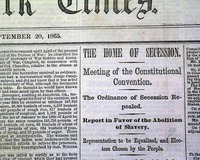 THE LOG CABIN, New York, October 16, 1841 Famous campaign newspaper published by Horace Greeley in support of the Whig Party and specifically in support of Wm. 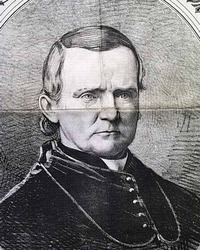 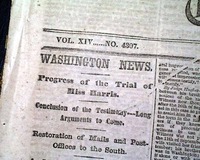 H. Harrison's presidential campaign. 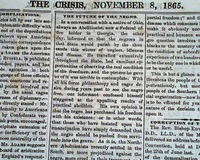 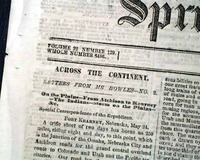 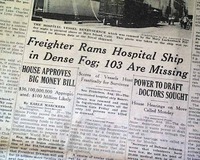 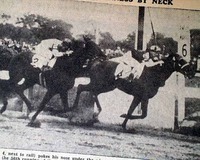 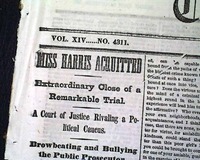 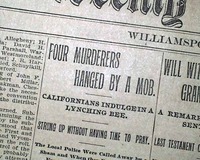 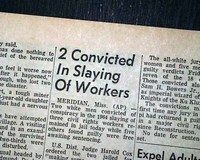 The paper continued after the election and eventually merged into his very successful "Tribune".